Well…since it’s been over a year since my last post, I’m sure most of you have already guessed that this blog has been abandoned. If anyone is still lurking around, I can confirm the rumors. Petoholics Anonymous has had a good run but like all things, it must come to an end eventually. This has always been a WoW blog so it only makes sense that when my interest in WoW waned, so did my interest in posting here. I really should have made this post months earlier than this, but I didn’t really have the heart to until now. For that year and a bit, even thinking about WoW brought back bitter sweet memories. I won’t burden you all with the details but let’s just say things are getting better for me now. If you’re still interested in my blogging, I’ve been posting infrequently on Lair of the Wolf Dragon, mostly about the random games I’m playing at the moment. Which from my posts seems like a lot of Wurm Online. I’m also on Twitter and Facebook if those strike your fancy. For anyone interested on what will become of my name generators, I’ve uploaded their sources to Github. If anyone wishes to continue their development/maintenance, you can do so with my blessing. As for what will happen to Petoholics Anonymous, I intend to leave the blog up for archive purposes for at least a little while. Eventually I will turn comments off to discourage spammers. For a parting note, I would like to thank all the commenters and supporters for encouraging me to keep writing my little tales for 5 years. It’s been a wild ride and I don’t regret a moment of it. And to all of you gamers…keep loving your hobby, no matter what game you play or what anyone else says. Live your virtual lives to the fullest. This was inspired by a little conversation Niqora and I had regarding the role of storyline in WoW, especially with regard to questing in the world at large, and the role of the players in those quests. There seems to have been a decided change in design as expansions come out, and both tendencies I have seen have their own drawbacks and advantages. From what I have experienced in quests while doing Loremaster, back before Cataclysm changed the world, the original model for WoW seemed remarkably like Skyrim or other Elder Scrolls games as far as story was concerned: a great deal of random quests and encounters that made the game somewhat of a sandbox (albeit defined by level), with longer chains every now and then that would tell a specific story. The history and fate of Trol’kalar in Arathi, for example, or the tale of the Redpath family in Darrowshire both required long, world-trekking effort and multiple stages. (Obligatory shoutout to the excellent song by Cranius here) By and large, it was up to you to seek out these quests and pursue them, and frequently you would know nothing of a quest if you did not find the giver out in the wilds, be it in the wilderness or in a dungeon niche. Generally, the shorter quests were sensible and not earth-shattering; you provided aid to those who needed it according to your stature as a heroic but not world-shattering agent. Even in the longer quests, you rarely received a large amount of recognition for your actions—you were a player in the great scheme of things, but you were aiding and aided by a great number of more important beings. These effects mesh well with the very large raids of the day; in a 40-man raid, there is much less of a ‘strike force’ feeling and more of a feeling that you are a part of something greater, an army to battle the terrible forces that oppose you. However, this same feeling can make it feel like you don’t matter, particularly before the widespread use of phasing. While TES games let you change the world in little (but visible) ways, in classic WoW, the bandits still exist, the monster in the hills respawns to terrorize the people again, and the man you helped from danger will be back again in a few minutes to be rescued again. Above all, however, there are rewards, little and big, for exploring beyond where you are led, and this is something I have always enjoyed. Comparatively, modern WoW (starting in Wrath and definitely hitting a high note in Cataclysm) has much more focus on telling a story in the outdoor zones, and focuses much more attention on individual agency and influence as it relates to the player. Many zones are far cries from what they once were; one has only to compare Silverpine Forest’s tightly-controlled war narrative to the meandering quests of alchemy and security that were once its staple to see how differently questing has been approached. Entire zones have little to no optional quests now—if you skip past them through dungeons or grinding, you will find almost nothing new until you work through the story as presented you. This allows the player, with heavy use of phasing, to effect visible change to the world. Take Hyjal, for instance, where through the quests you battle back the elementals and slowly recover ground, which is healed through the aid of your actions. Troubles with grouping aside, this can be a great feeling—you’re involved now, and the world responds to your efforts in a way you don’t get in the older quests. However, from a role-playing standpoint, things get problematic. As such an integral part of such grand events, you cannot fade into the background, and everyone has been the hero of Hyjal, or the savior or the Tol’vir emperor, or any of the other great acts. There is a canon you create through questing that isn’t easy to shuffle aside, and I’ve found myself and those I RP with simply ignore the vast majority of the questlines. This is in stark contrast to some of the more epic questlines of vanilla; the Darrowshire quest in particular has been a unifying experience for a few of our characters because of the way it was handled, as a large group quest at the end. Raiding, too, focuses more on the players, as the rise of 25 and then 10-man groups has made everything a little more personal. To be sure, I enjoy 10-man groups more than the larger one; this is not a judgment of value but merely of flavor. There are also more smaller humanoid bosses; though I’ve never seen the original Naxxramas, the bosses from Molton Core and Ahn’Qiraj are typically on a much larger scale than those in more contemporary instances. Another central facet of modern quest design is the consolidation of questgivers. Very, very rarely is there anything in a zone that you will simply stumble across—breadcrumb quests and regular quests both bracket virtually every quest now, making it much faster to level and quest because both the givers and objectives are always bundled neatly nearby. This is an efficiency vs. verisimilitude argument, and one I am torn on. Some of the questing in vanilla was simply tedious, with way too much walking and general distance involved, but as I mentioned before, I like finding interesting things in the wilds when I’m wandering, and the consolidated design currently used makes it impossible to find something you haven’t been essentially led to by the hand. It is difficult to say which one I prefer, personally. The new techniques have definitely been more effective at weaving a cohesive storyline that the general populace gets to experience, and it is nice to get both recognition and results from your work, but it also rings false occasionally, without the opportunity to give character by careful quest selection. Little things, like not finishing the quest in Hillsbrad where you poison a dog, are often key to bringing some depth to a character, and when there are no options with what quests to take, the chance to build on your character is gone. I honestly am not sure what I would do, given the chance…perhaps keep most of the flowing quest chains that are common now, but scatter more optional quests around the wilds, so those like myself who love the little thrill of exploration can have their cake and eat it too. 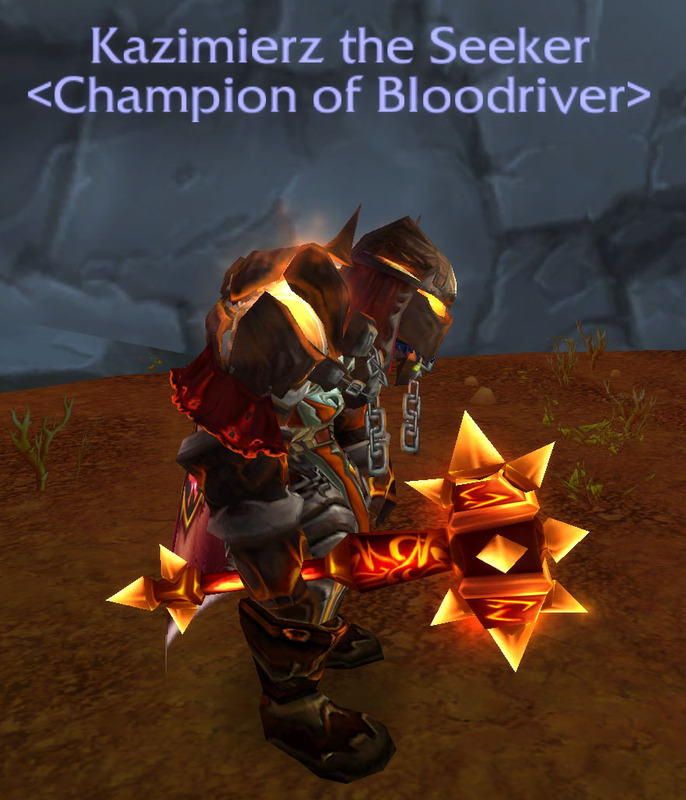 I don’t believe I mentioned this before but 2 years ago, Kazi decided that he wanted to try to get Sulfuras, the legendary mace from Molten Core. He very quickly and dutifully collected all the materials for the Sulfuron Hammer through multiple MC runs and helped his blacksmithing friend to get the recipe for him. Within a couple months, the hammer was created and all he needed to complete it was the Eye of Sulfuras. An item that has a 4% chance to drop off of Ragnaros. Months went by and the want to run MC dwindled with each week for his guildmates (including myself), and there were times when poor Kazi had to run the whole place by himself at level 80 as this was back in Wrath. The Eye would not drop. 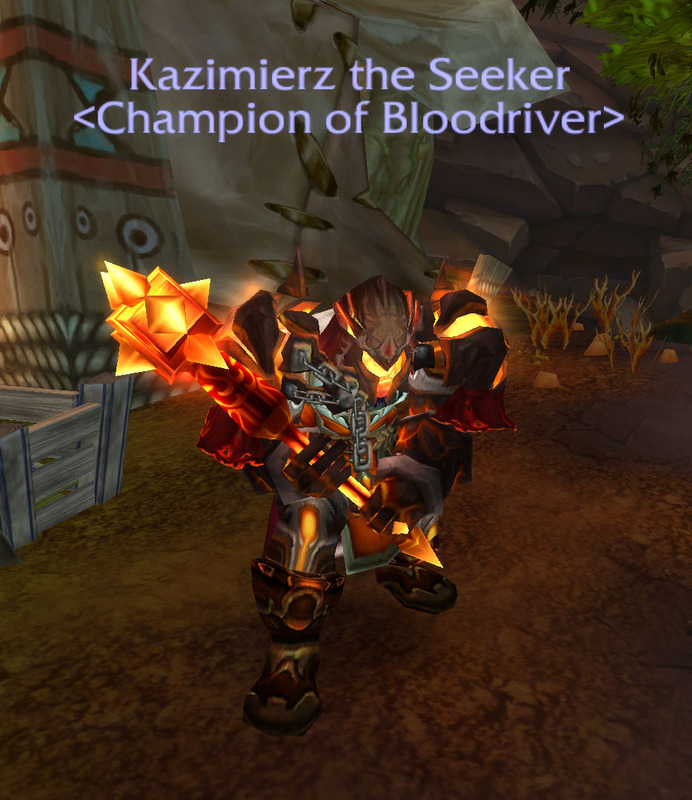 More months went by and Kazi had done so many MC runs that he had become exalted with the Hydraxian Waterlords. The Eye would not drop. Even more months passed. Kazi was feeling like he would never see that Eye. The launch of Cata and its huge stats increase made running the raid much faster and easier, and so I was more inclined to help him and encourage him to continue. Almost every week, we ran through Molten Core, sometimes just the two of us and other times with friends. The Eye would not drop. This past Sunday, we were joined by Ivi, a druid that’s part of our regular raid group. She came because she still wanted some mog gear from there. 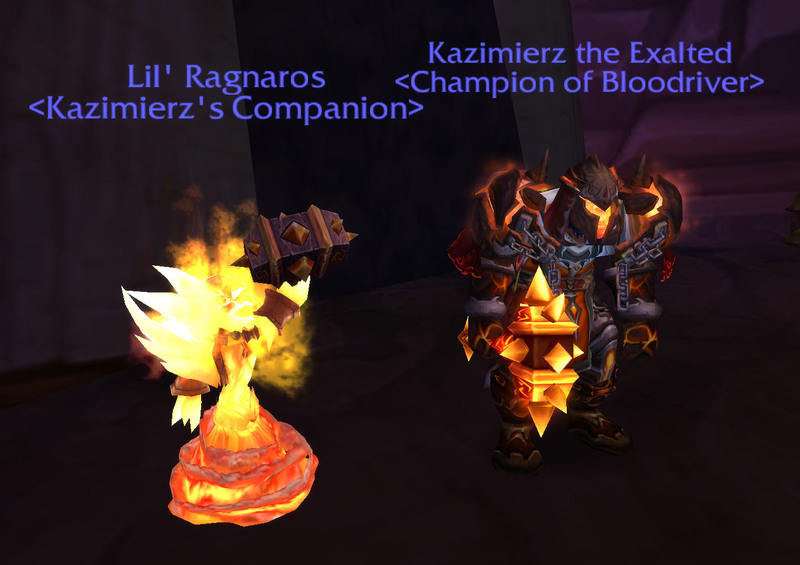 We went through the motions of killing all the bosses and then making our way to Ragnaros. The big fiery dude dies and Kazi loots automatically like he’s been doing for the last 2 years. This time…the Eye does drop. 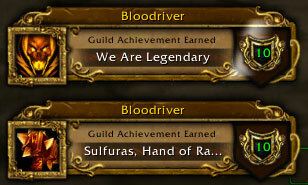 There’s an explosion of congratulations between Kazi and I talking over Skype, and then in raid and guild chat. Well said, Ivi, well said. 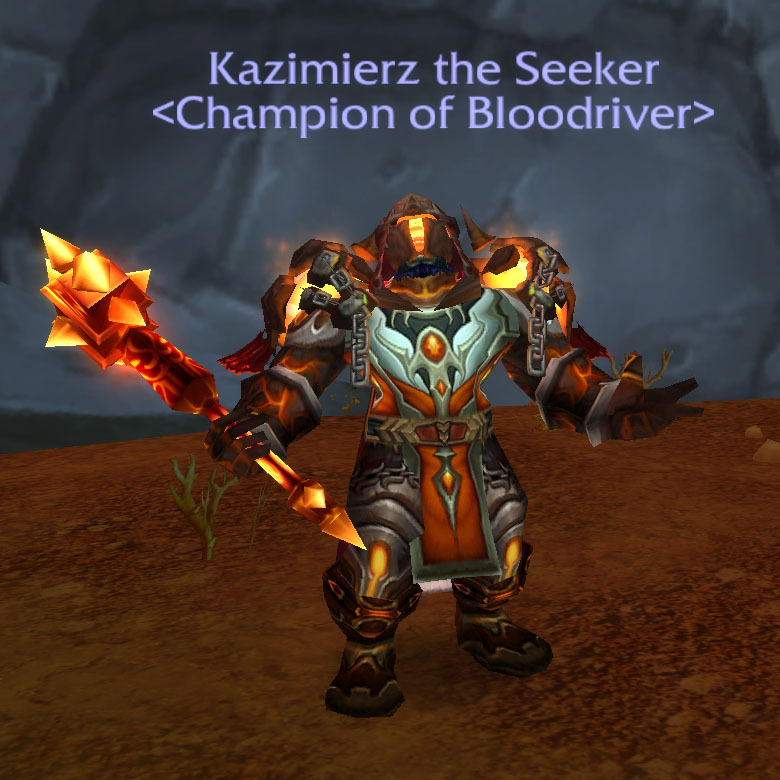 Kazi loots the Eye and then actually asks if he should make the mace now. He is answered by a chorus of “HELL YES!” on all sides. He quickly pops his Jeeves and grabs the hammer that had been sitting in his bank for over a year. 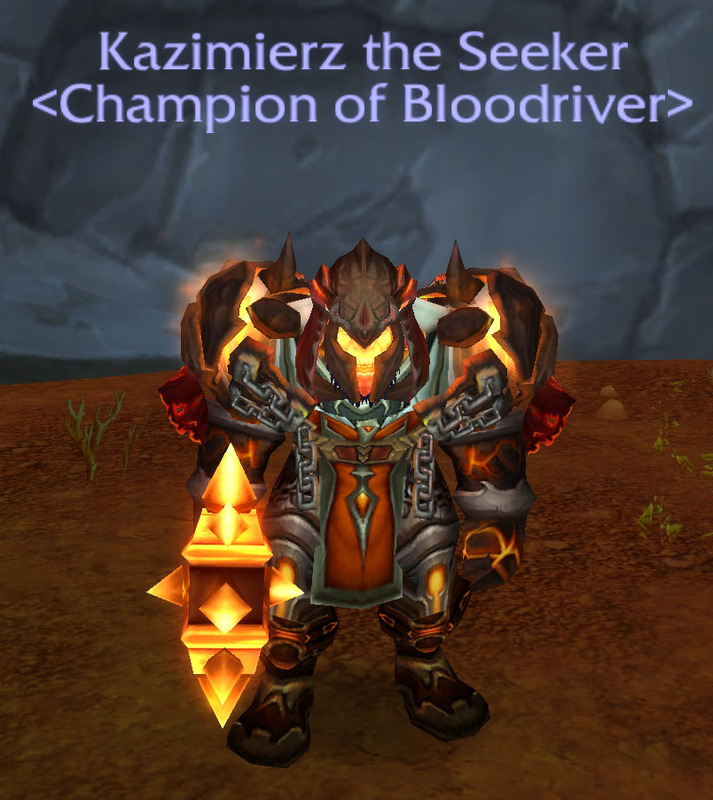 So after two years of trying week after week, Kazi finally got his shiny mace and our guild its first legendary. Lord knows he deserved it after such dedication. His character wears it well too. "IT TOOK 2 YEARS BUT NOW IT'S MINE!"